Dunja Roberts is a professional hand spinner and weaver with a special interest in native breed wool. She runs a busy teaching studio for hand spinning and weaving based in the Black Mountains in South East Wales. 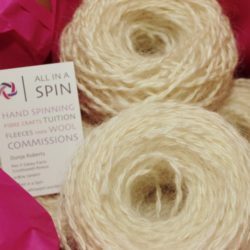 Dunja undertakes spinning commissions for clients all over the UK, turning their fleece into bespoke yarn as well as weaving to commission. Her work is available to buy from her website or direct from the studio and visitors are welcome by appointment.